Atom site environments can now be used to define a coordination polyhedron (besides fixed-sized and generic spheres, i.e. basing upon connectivity bonding spheres) in the "Add polyhedra" function. Additionally it is now possible to take over the coordination sphere (the bonded neighbouring atoms) of a (central) atom as is, i.e. without filling the coordination sphere. 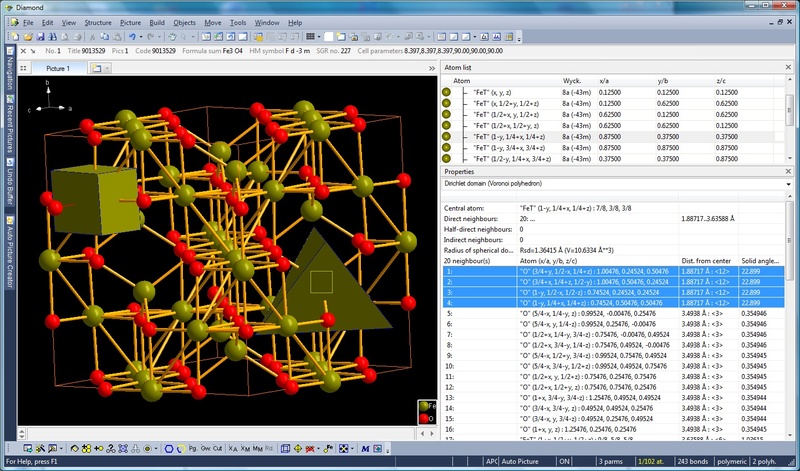 Although Diamond offers a lot of settings to create coordination polyhedra from complicated environments and in spite of the epsilon angle that decides, if two or more triangles form a higher polygon (polyhedron face), it may become a difficult task to achieve your desired polyhedron. Besides the method to construct a polyhedron by collecting the constituent atoms from the selected atoms, you can also construct it from bonds (between the constituent atoms, i.e. the bonds will be converted to edges). Triangular polyhedron faces where you expect to have higher polygons can be combined simply by clicking the polygon's atoms, or - vice versa - a rectangle or higher polygon can be split into lower polygons and triangles, if necessary. A more or less manually created coordination polyhedron (using the above mentioned methods) can be assigned to other atoms in the structure picture belonging to the same site. (That is: a polyhedron prototype is assigned to an atom site each.) In general, you can do a Copy and Paste of polyhedra between atoms of same site. Voronoi polyhedra can now be created for selected atoms or atoms of selected sites basing upon their Dirichlet domains. (Example: magnetite from COD:9013529). There are several options for the style of the polyhedron as well as if and how to show and connect the neighbouring atoms. Infos about a selected Voronoi polyhedron (neighbouring atoms, distances, bond strengths, solid angles, etc.) are available from the Properties view.